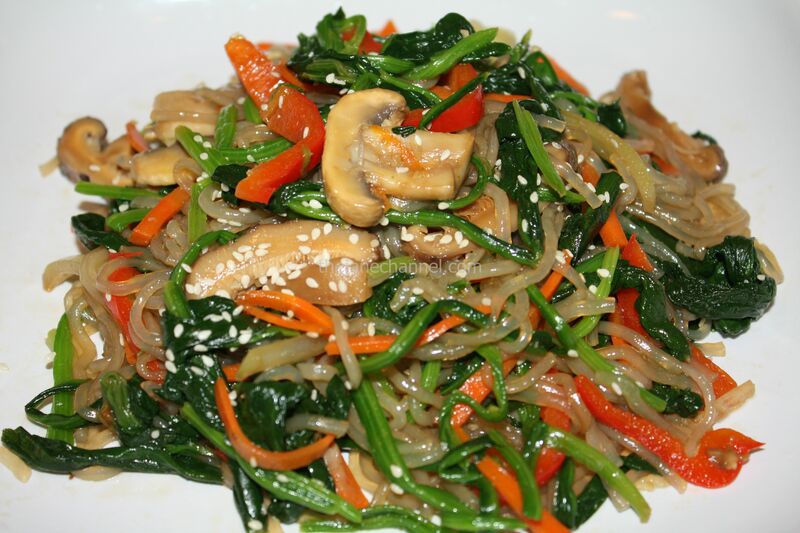 Other than Soon Dubu, Jap Chae is another dish I ordered a lot at Korean restaurants. 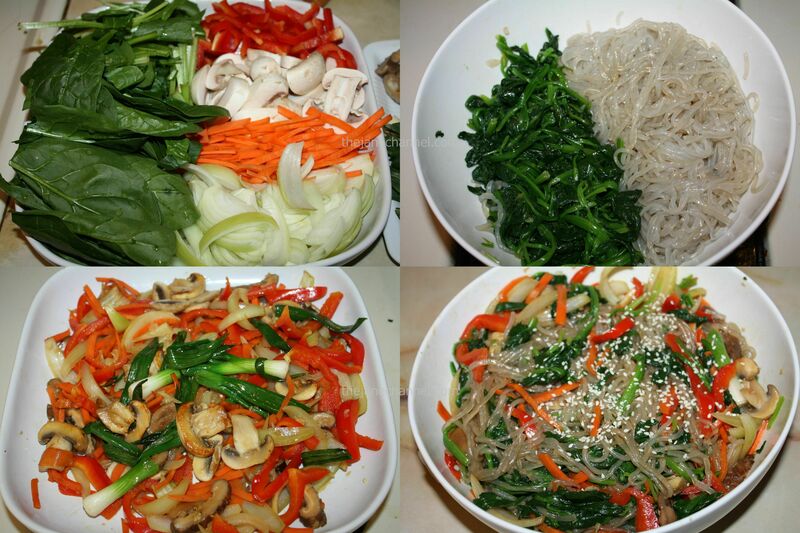 Jap Chae is composed of noodles made with sweet potatoes, and combined with mushrooms, spinaches, peppers, carrots and scallions. Beef can be added or left out as a vegetarian dish. It can be served as a side or a main dish, hot or cold. Soak shiitake mushrooms in warm water for 1.5 hour or until soften. Remove stems and slice. Cook noodles in a pot of boiling water for 5 minutes. Drain and cut the noodles with scissors. Stir in 2 tablespoons sesame oil and 2 tablespoons soy sauce and mix well. 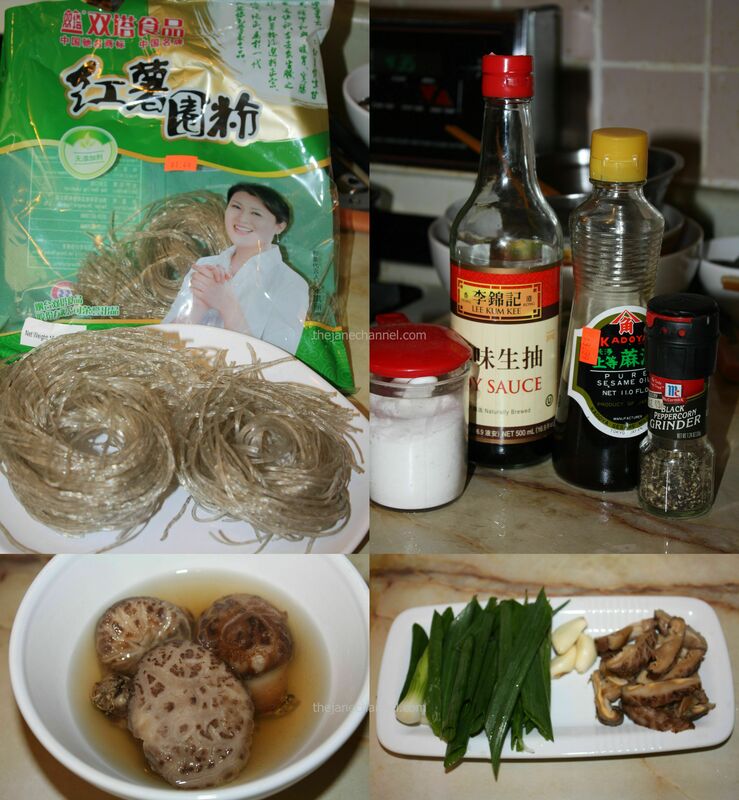 Place noodles in a large bowl. In a pot of boiling water, cook spinach for 1-2 minutes. Drain and rinse with cold water. Squeeze the water out and mix with 2 tablespoon sesame oil and 2 tablespoons soy sauce. Add spinach to the large bowl. Heat oil in a skillet over high heat. Stir in garlic and scallions, cook until fragrant (about 1 minute). Stir in onions and carrots, cook for 3 minutes. Stir in mushrooms, shiitake mushrooms and peppers for a few minutes or until everything is cooked. Mix all vegetables into the large bowl. Add sugar, 2 tablespoons soy sauce and 2 tablespoons sesame oil. Mix well. Add sesame seeds and pepper to serve. Yum Yum Yum, I wish i had one plate over here! Can I use any other oil except the sesame oil? It is quite hard to find it in my country, let alone my small hometown. Also, can I exclude the red pepper or it loses a lot in the taste? The red pepper can be excluded if you don’t have it. But the sesame oil is quite essential for both flavor and smell. You can use other types of vegetable oil as a substitute, but the taste won’t be quite the same without the sesame oil. Hope this helps! Thank you for your answer! Its not that I can’t find the red pepper, its that I am allergic to it! I ll try to find sesame oil then. In a bigger market or oriental market! Thanks! It’s about 1-2 servings.